Uh…no. That seems like quite the stretch going from point A to point B there. Quite a stretch to go from point A to point B, or quite a stretch NOT to go? Answer me that mister smart pants. Ok, maybe it is a stretch. I still find the resemblance interesting tough. Have to agree, ‘quite a stretch’. I think Fletch and Tom have actually helped make my point. Like I said, to me a good “inspired by” poster is one where the new poster deviates enough from the art that inspired it to become it’s on thing. And that’s what happened here. Do the posters have a lot in common? On a visual level, not really. But the In My Sleep designer definitely borrowed the idea of a figure trapped in a spiral from Vertigo as a way to hint the psychological aspect of a man trapped within his own affliction. 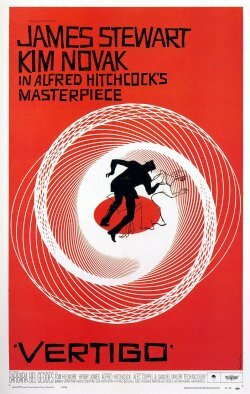 Again, I’m not saying that the In My Sleep Poster is a copy of (or even resembles) Vertigo, it’s just inspired by it. Perhaps resembles was just the wrong word here, but like Philip points out there are some clear similarities, and I still find them interesting. And just to be clear I would like to say that I by no means intend this post to be a slam on the poster for In My Sleep, which I quite like.